Timely and early diagnosis of diseases is the basis of medicine and the guarantor of successful treatment. The power of any medical institution determined by the capabilities of its diagnostic facilities. Erebouni Medical Center has a diagnostic clinic, equipped with cutting-edge and innovative diagnostic equipment, which is painless and in short time frame provides establishment of accurate diagnosis of pathology or diseases. The diagnostic examination and evaluation of performed treatment results and effectiveness which are conducting in the Clinic of Diagnostic organized in accordance with the guidelines and recommendations of international professional associations, meets international quality standards and carried out in complex evaluation and correlation with the clinical data. Clinic of Diagnostic offers a wide range of diagnostic programs: from the simple and standard check ups up to complex specialized particular group of diseases, which combine several informative examination diagnostic methods. The clinic performs almost the entire programs of «Check up», from standard to advanced, from general to highly specialized. Early diagnosis and prevention of diseases is the main motto of the Clinic of Diagnostic. In case of necessity, the patient is sent for treatment to a specialist in the specialized departments of multiprofile Erebouni Medical Center. For each patient an individual approach with individualized diagnostic examination strategy and consequent treatment is performed. Clinic of Diagnostic is staffed with highly qualified and experienced specialists, who had specialization and training in leading medical centers of Europe, America and Russia. 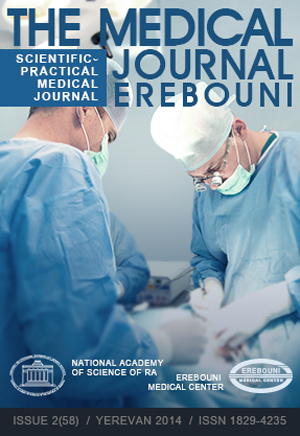 Due to multidisciplinary structure of the MC Erebuni it has staffed the interdisciplinary team of high qualified specialists for provision of joint consultation in diagnostics and organization of error-free strategy for the integrated treatment of patients with complex and combined disease that requires multidisciplinary approach.